Andrew Rurik is a film school graduate from Biola University that has worked on Hollywood sets as a lighting technician producing shows & movies but quickly realized he wasn’t being valued and projects were unpredictable. So he decided to get into freelance filmmaking which started to make him more money but the problem was he had no predictable way to attract & convert new clients. So In September Andrew decided to solve his marketing issue & join the Next Level Creators program. In less than 30 days he has already landed a $12,000 /year production + distribution client. Paul: All right. Hello, next level creator community I have on with me today, Andrew Rurik from southern California and he’s got an incredible story. He is a graduate from film school. He has done some amazing things in the film industry, has been in it for a long time and he has joined the next level creators program and just recently landed his very first commercial campaign for over a thousand dollars a month in management, $12,000 a year for his business doing commercials and distribution. So today we’re just going to talk about what his experience was like. I’m first seeing next level creators like how he interacted with us. Um, how skeptical he was of course, is this a real thing? Is Paula scam and then joining next level creators getting to meet us, getting to be in the community and what his experience has been like going through the program, getting his first client and where is that now and what he’s planning to do after that. So I’m Andrew, welcome. Thank you so much for doing this. Glad to be here. Awesome. So I always like to start these things off by kind of starting off with where you were before you joined the program and what you, what your history was. So can you tell me when did you want to, or when did you know you wanted to be a video creator? Andrew: Um, I knew I wanted to do stuff creatively with video from about the time that I saw that movie who framed Roger Rabbit I knew instinctively as a six year old and why my parents were letting me watch this and six is still a mystery to me, but that the cartoon characters that I was watching and humans that I knew existed and I knew that they weren’t real the cartoons, but I saw them interacting and way that’s magic and I want to do something with that. I want to be a part of that creative process. And so shortly after that, picked up a camera for first grade project and blew the teacher way and then have been kind of producing stuff ever since. Paul: Yeah. So all the way since first grade, um, and before it was your, your passion was ignited. That’s what that’s like. So many of us, you know, we, we, we have that passion for video. Me and my brothers, we used to make home videos when we were kids at our beach house. Well our beach house, but the vacations we went on when we were kids. And um, so through that of course you had this spark of passion. You fell in love with video. What was it like after that first grade do a video project and then how did video show up throughout your, your life over the next few years as you evolve in the high school and then into college? Andrew: Yeah, so I kept doing video stuff and I got hired by like friends, parents to events that they had and then early high school and Beyond and then went to film school, graduated from there, worked in Hollywood for a couple of years, is a lighting technician on movies and TV shows and music videos, things like that. But at tiny movies we would know a couple of, played at Sundance in like 2010, 11. None that really were huge. Um, but I always kinda kept getting calls from clients that I had met, you know, randomly who knew I did video stuff and they were like, Hey, can you shoot for our company or our product launch or what have you. And I just kind of kept getting more and more of that work and it kept paying better than the day rates, as an electrician on a film set. And I kept finding more enjoyment in that and getting to work with interesting people that the hours were a little bit less hectic. Andrew: There still hectic, but they’re less hectic for the most part. And uh, yeah, so I was full time freelancing or I had been for many years now, but I’m kind of hit and I think we’re probably leading into the next question, but I’m kind of hit a wall with Roi. So making a video for someone costs them money. It’s an investment on their part. And so much of my uphill battle was trying to convince people of the worth of the video that I was making for them when they saw a number on an estimate going, holy crap like that. And then the subsequent question being, well, how do we know works and me going, uh, that’s a great question. Um, youtube hits a and never being able to give a direct correlation between the product that we put together for them and its effectiveness and never being able to draw or illustrate that there’s a way to draw a straight line from point a to point b and measure the effectiveness of spread or reach or have direct sales if it’s for a specific product, things like that. 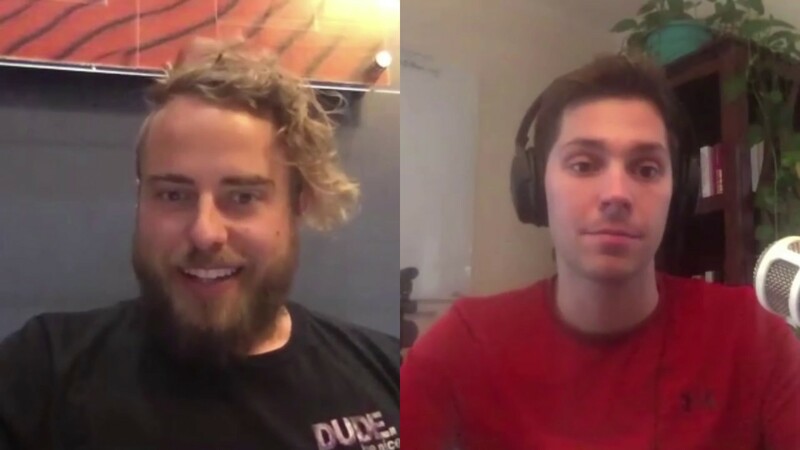 Andrew: So that was Kinda the impetus and that was really, for me, that was the selling point, um, to, to join up and learn because, you know, I, I, it’s, it’s insane to me how many opportunities I was not able to capitalize on because I didn’t have a way to prove an roi to someone who was there with a checkbook in hand going, okay, as long as you can prove to me that this money is worth it, it’s yours. And I just have to say honestly, I don’t know if I can. Yeah. And that honestly, that shows a lot about your character. The fact that you were transparent enough to, I don’t know, and to tell people like, yeah, I do great video, but I don’t know if these videos are working, and so that inherently you saw the missed opportunity costs is what we would call that, right? Andrew: Like you have, you have one skill set where you’re incredibly good at video, but the missing of that, that link with distribution is what was causing this problem in this gap. I’m not allowing you to get the higher value sales you want it. And, and, and even, you know, there were times where, you know, even distribution, you know, I would produce a video completely done, deliver it to a client two years later, still hasn’t seen the light of day because they’re not aware of how to distribute it. And that was kind of the potential was either I was distributing it with not a really clear vision for how to do that. Um, or trusting that the client would distribute it in a way that was effective and just kind of washing my hands of it at that point and going, okay, here we go. Yeah, go with God like good luck and it’s almost, I mean I remember because I’ve done the same thing, um, I’ve shot videos for people and not distributed them before and I remember them putting them on their website and then I checked the youtube views. Andrew: It’s like, it’s been on there for four months. It has 53 views. You’re like, Yay, that was a great $3,000 investment. 50 three people are very happy and I remember actually thinking that that was a good thing for me because I was like, thank goodness I didn’t have to figure out how to distribute that. I would have failed. But then I started thinking about it and I remember talking to one of my business mentors at the time who was a facebook advertiser and he was like, you really don’t, aren’t looking at things clearly like you. It’s your responsibility to add value to the client, right? Not just to make money and deliver something pretty. Um, so tell me a little bit, because before you got into next level creators, what was your average video project sites where you kind of varying all over the place or it was all over the map ranging from Kinda managing, coordinating full crew productions of five to seven or more people to hey we need you and the camera and you’re going to edit it later and that’s just kind of all we have a budget for. Andrew: about 18 months ago, you know, I didn’t have a website or anything. It was purely just referral word of mouth, you know, and it worked for awhile. I mean relatively consistently. Um, but you know, it just kind of get to a point where you go, oh, I don’t, I don’t want to rely on chance anymore as much as I don’t have know. If I can remove a couple of variables in this game of chance of finding or soliciting or having people come knock on my door, I should probably do that. And I think that’s a, I would call it an inflection point in a, in a creative career where they decide that, hey, I’m, I realized that there’s this gap that I don’t have the business acument I need to get to that next level, whether that’s to get there for my family to get my income up, to have more freedom or timeframe, whatever it may be. And so that inflection point hits where you say, alright, the costs of doing the same thing is now higher and the cost of learning these business skills and strategies that are needed to get to that next level. And for you, of course you came across next level creators. What, how did you find us and what was the messaging that you initially saw? Andrew: removing some of the guesswork from people showing up from like, rather than having to like go seek out opportunities, opportunities coming. Um, and so that was kind of an initial driver to say, okay, I wonder what this is about. And secondarily, um, and which ultimately became more important was kind of like we chatted about earlier, was the value add Roi stamp or a, um, kind of addition to what I was already doing. Um, and being able to not only produce a video but say, hey, we can also show you how it’s being effective and we can really increase your sales and we can partner with you and an extension of your company and your goals to help you achieve what you want. And by that kind of, in that achieve what we’re looking to do to. Um, and so that, uh, was, was Kinda the second bullet point that became a primary driver for, for being a part of this community. Paul: Yeah. And so huge value add by adding distribution. And then other big value add was, was no longer relying on hope marketing and being able to get business owners to come to you and wanting to reach out to you and not just saying, Hey Andrew, I want you to shoot my video, but saying, Hey Andrew, I want you to run my commercial campaign and helped me grow my business and work in a win win scenario where we both grow together. And so of course that was, that was the message that stood out to you. Um, how skeptical were you if this was the real thing? Andrew: documented case studies of successful people like myself joining up. Um, and I’m sorry, not successful people like myself, but people like me joining up and becoming successful that it was at the very least, it was a compelling statement and compelling enough for me to go, okay, if this works, it’s going to be worth it. And even if doesn’t totally work as advertised, there’s going to be some stuff in here that I can borrow. Um, and at, at the very least, there’s going to be stuff that I learned that’s going to be helpful longterm. Um, so it was kind of a, it, it made more sense to do it. Then it didn’t. Even if it wasn’t everything that was advertised, if that makes sense. Yeah. And we had a little bit of a preacher out of course before, before this, just so you’re not going to get connected on what this interview is going to be like for everyone. Andrew: And you told me that, you know, at the time when you were looking at excellent and creators, you actually had a client that you were thinking about running a commercial campaign for it. It was. So it was less that than it was. I had already shot the videos for them, so I had gotten hired to shoot videos for a facebook ad campaign and that was it. So I’d gotten hired to shoot them and then I had delivered them and was like, okay, you know, check that box. They’re done. Kind of moved on moving onto the next thing and sort of going through some of the content and it was like, okay, hold on. Andrew: I wonder if like I wonder who is managing their facebook campaign that I just shot these videos for. And so I went back to these guys that I had just worked with and I said, hey, you know, out of curiosity, who like, what is your plan for these? How are you planning on growing your facebook page? How are you planning on doing, garnering sales, how are you planning a building, you know, a market. And their answer was what we know, we’re in a post a bunch of stuff and watch the uh, watch it grow organically. And I kind of went, oh, that’s fascinating. Um, you know, uh, organic growth and I just can’t. I had, I think earlier that day I had read the, the, um, the research punch list with just a couple of bullet points on it and you know, organic growth is not a thing and I just, it was top of mind already. Andrew: And I kind of was like, so I need you guys to be aware that organic growth just doesn’t happen anymore. It kind of was able to rattle off some stats and I could hear over the phone, their voice is sort of go, oh, which we do. And I went, well, funny you should ask. And from there was able to kind of almost like reverse engineer having already shot some videos for them into a commercial campaign that they were already planning on doing. They just didn’t know how to do it at that point. Sure. Um, so it was kind of this weird, almost backwards kind of piecemealed together, but it totally worked out. It was a great way to accidentally stumble into this world. Paul: And so I, I mean, we talked about it, you, you, you joined the program, you have this client you’d already shot in videos for you having this conversation with them. You’re going through our training, you see the punch list, you learned these stats that of course help you close the deal, but you also, you attended a q and a call with us and you know, you were kind of asking questions like, what, how do I get a deal across the line if I have someone who’s really hot wanting to do this right now. Do you remember what your biggest takeaways were from getting right into that program? That for one gave you the confidence to do this? And then for two, like what it, what parts of next level creators helped you to make this happen? Andrew: I think, I think for me it was a couple of things. So the use, especially in answering those questions were really helpful in saying like, Hey, the, the down and dirty, go to this spot and do this stuff and then go to this other spot and do this stuff and that’ll be enough to Kinda like get you across this, this specific finish line and once you’re there, here’s these other things that you’ll need to do, but for the time being like, do these right now and you’re good to go. Um, and it did give me, it gave me the language that I didn’t immediately have to communicate effectively with this potential client and kind of be like, okay, look, here are a few things that we need to go looking for. It gave me questions to ask them. It gave me a, like you said, the confidence to be able to approach them and sound like I know what I’m talking about. Andrew: Even though I’m, I really, I had some basis, I had tried to kind of do it before, like I said, I had a, I’m, I’m all about like, I’m okay with paying for knowledge that I don’t have and I had tried to do it kind of once before and it didn’t super workout at all, which I think maybe even lead me to be more open to being like, okay, where did I go wrong? What did I do wrong the first time? Um, and um, yeah, it gave me just sort of the resources immediately to confidently approach and say like, Hey, look, here’s what we’re going to do. A what do you think? Like, let’s do this. And they went, yeah, okay, let’s do it. Sounds good. Paul: Yep. Yeah. So that, that’s good. So it was really a matter of focus knowing where to go at the right time and what to do at the right time to get that deal across the line. And, and of course to make sure that you’re setting yourself up for success with that, that deal that you got. And so now you’re in a position where you’ve solidified your first commercial campaign deal. And since when was that, that date that the client came in, do you remember? Paul: and for anyone who’s listening right now, this is the way every commercial campaign starts out and I say this, you cannot panic in the very beginning of launching a commercial campaign. You’re going to be starting small. You’re not going to be launching with hundreds of thousands, millions of dollars. Here we’re, we’re, we’re trying to get small wins and your campaign is set up to where we have the strongest message possible set up to go to your ideal client, the place where we think they are most likely hanging out and we launch and we’re testing. It’s a hypothesis that we’re testing in the marketplace with these awesome videos we created and some simple distribution we put together the way you get to have a lot of fun. It’s like we get to where our science hat on for a little while and you’ve already gotten a sale. So here’s what happens next, right? Paul: Andrew, you’ve launched a campaign, you’ve gotten a sale, things are moving and now we get to double down on what’s working and remove the waste and this is exactly the same thing that Daryl did for his client over in Australia. He got his skincare client, he was working with them on facebook ads. He launched kinds of things, worked tons of things, didn’t about broke even or when a little bit negative turned off what wasn’t working in a boot profit, return on investment for that client’s commercial campaign just skyrocketed up to about four and a half or four point five x Roi, which is spend $1, make four and a half dollars. Not too bad. I think if anybody could get that kind of early to be super into it. So that’s where we are with your your campaign right now, which is really, I mean it’s one of my favorite things. Andrew: 2019? Yeah. So, um, the irony is I don’t think that this particular business falls within the niche that I’m going for. They just kind of happened to be there. So I’m still working through figuring out what that is and where kind of the next steps that are going to be. Um, but going through some of the clients that I’ve done one off videos for or even ongoing video support for and trying to see how this can be beneficial or effective. And, and almost reverse engineering a couple of other clients into larger campaigns, larger, you know, management budgets, things like that because a couple of them are doing things with social media, with a ad campaigns and things like that. And so I’m kind of asking good questions about what the effectiveness is, what the effectiveness levels are, what are they hitting their targets or do they feel like it’s being effective and trying to see if from other preexisting clients there’s interest there in taking their campaigns to the next level while I kind of work on figuring out where exactly it is. I want to take that stuff too. Paul: Yeah, and that’s, that’s a, that’s a great place to be. You’ve got a client, you’re building what we call our proof of concept, which is a proof that this works. I know how to get results, I can get results and then we can leverage that expertise to bring in more clients and more clients and it’s a snowball effect. That compounding effect of doing the right thing over time and how that, how that gradually an exponentially continues to improve for you. Because that’s really exciting. And where do you want to be in terms of revenue in the next year? Do you have a target that you’re really shooting for? Andrew: The, it’s a bit nebulous, but it is enough so that my wife can come on full time with you. Paul: That was, that was one of my biggest things I wanted to do in my business was to get my partner, uh, Miranda in my company as well. And of course we’ve done it. But um, yeah, it’s a special moment that day that can happen and I’m excited for you to make it happen. Is She, is she excited about that too? Paul: of course. Yeah. And the good news of course is with commercial campaigns, it’s recurring, it’s easier to forecast and we know if we’re getting our clients results that are going to stick with us because who would ever turn down $4 to one. So that’s great. And in terms of, uh, in terms of the types of videos that you shoot, a lot of people think when it comes to commercial campaigns that, you know, you’re basically stuck with talking head videos and you are like, you have to shoot really boring style videos now. What kind of styles and videos, what’s your background in terms of styling and things that you like to do with the videos you’re making? Andrew: I have a background in both music videos and a lot of nonprofit storytelling. Um, so I’ve done a lot of work with nonprofits and companies that do that have like for good elements to them, if that makes sense. Um, and I’ve spent probably the better part of a decade learning just how to craft good stories that aren’t just talking heads, that’s using b roll rather that that stuff that we’re calling together ourselves or set that’s preexisting. Um, and repackaging it in that, into something that is compelling and will leaves an impact and I’m people to action in, you know, whether that’s donating or getting involved or things like that. Um, so I, I kind of bring these two weird, uh, um, ends of the spectrum to bear on the stuff that I create. Paul: And that’s awesome because that’s you bringing your artistic mindset and creative, you know, thought process to this, this whole idea of differentiating companies. And I think that’s the most beautiful thing about what we get to do is we really do have creative freedom and the clients look to us for that. Um, I know in my dealings with one of our financial advisor clients, for example, right, whenever we’re working with them, um, they’re not telling us what kind of video to create. I’m advising that I say, all right, well, we’re going to need at least a couple testimonial interview styles or direct testimonials. We’re going to need a nice demonstration commercial, which shows how your financial advising is different, right? And we can do that in a documentary style. We can do that in a really simple heck, I’ll do a slide show if you want to style, we can do whatever you want, but the creative aspect of it is you have freedom to choose and that’s really the beauty there. Um, wonderful. Great. Well, I don’t, I don’t really have any other major questions. Is there anything that you would say in regards to your experience so far with next level creators? You know, would you recommend it to anyone else who wants to be a successful video creator, director, filmmaker, um, and just any overall final thoughts you’d have for someone considering it? Andrew: I would say that it’s a specific type of creative that would, that this would be very beneficial for. And I think that for those of us that are kind of stuck in the grind of trying to find new work, finding work and worried about where the new is coming from, um, this is, it’s been just sort of a massive mindset shift in terms of how and why and where and aligning priorities with and just a whole host of things that I didn’t have before that I have now. And a different set of a different lens that I approached things with and look at things with, um, you know, for, for, you know, someone who is looking to just do, you know, narrative, film, production, this, this might not be your thing. Um, but, but if this is, if this is, if you were freelancer who’s putting together productions for companies and you’re worried about the phone not ringing anymore, this would definitely be something that’s worth the investment. It’s worth checking out and it’ll, it’ll change the way you think about what you do. Paul: I really appreciate that. Was very nice and got it. And also this very, very, uh, very good to get to know you on a deeper level today, Andrew, um, our q and a calls, you know, sometimes we’ll have a, we’ll have chats and we’ll answer questions, but it’s always good to get to meet people more in person. Do these interviews and hear your stories. And I was telling Andrew before this, I always, whenever I see someone get their first client, something about it just makes me jump for joy because it, it’s that. It’s that inflection point where the person now knows this is real and their business is about to rapidly move in a positive direction. So congratulation once again and thank you for doing this interview. Of course. My pleasure. Alright, we’ll stop it right there.